USA / Canada  2003  82m   Directed by: Chuck Bowman.  Starring: Nicholas Lea, Jamie Luner, Steve Bacic, David Lipper, Teryl Rothery, Karl Pruner, Anthony Sherwood, Marie Ward, Stephen J. Cannell, Colin Glazer, Joseph Marrese, Evan Caravela, James Kee.  Music by: Richard John Baker. A space shuttle crew return to Earth, bringing alien "seeds" with them. These begin to grow into alien life-forms, needing hosts to complete their evolution... When their number reach the Threshold amount, they will be an unstoppable swarm, so it's up to two scientists to stop them beofre it's too late. I realize there was a limited budget for this "straight-to-cable" movie, but for crying out loud, NOTHING in this embarrassing laugh-fest looked even remotely real! The paper-thin plot involves some sort of "moth nebula" that infects an astronaut docked in outer-space while fixing a spacecraft just outside of Earth's atmosphere. The astronaut is hospitalized, and then starts producing 'cocoon-like' objects on his fingers that breed 'alien moths'. Next thing you know, the moths fly out the hospital window and start infecting (biting) innocent citizens all over the city who happen to share the same blood type. 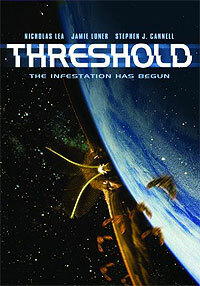 TV FOX fixtures, Jamie Luner ("Melrose Place") and Nicholas Lea ("The X Files") headline this atrocious 'movie' as a bug scientist and astronaut scientist who come together to try and stop the moths from infecting people. Luner is absolutely embarrassing as the bug scientist whose big discovery towards the ending of the film is pinpointing the location of the 'bug hideout shelter' simply by coincidental means. Her brother happens to take a photo of his girlfriend while a suspicious looking character just happens to be walking by in the background (LOL), therefore giving Luner's character a big clue as to where the moth people may be hiding. The biggest laughs of all come from the low budgeted 'special effects'. One 'infected' woman is held captive in an interrogation room. She does her best 'scaredfreaking out' impression when all of a sudden, 'computer-generated' arms lash out from her sides and quickly disappear again. Considering she is fully dressed, did the producers not even care about how the arms suddenly appear, then disappear without even tearing her clothes? And the fact that the arms resembled that of a papier mache model makes the whole situation even more laughable. Another laughable scene involves the 'thing' that is being guarded by all of the infected people. Some sort of big balloon sac with a 'human-like' being inside of it. We of course, never get to see this, because it gets blown up on a tug boat at the end of the film. This thing is supposedly the film's central object of 'horror', something that we never get to see, yet are supposed to be very scared of. I can't stop thinking about how bad this movie was! What a stupid movie! It's not even worthy as a 'straight-to-Sci Fi Channel' film. To top it off, they even throw in the usual megalomaniacal military officer who insists on 'blowing up' the whole city to try and stop the outbreak, including all the other innocent civilians who haven't been infected. Maybe this movie should have been on Comedy Central instead? I say, skip this trash and rent "Dog Soldiers" instead. Review by Aussie Stud from the Internet Movie Database.